The Bay State's top performers flourished at the 32nd Annual New England Interscholastic Indoor Track and Field Championships. Overall, an experienced Massachusetts contingent collected six individual titles, a relay victory and a pair of meet records. The nation's leading shot performer, Innovation Academy's Aiden Felty registered the initial meet record on the day, taking the implement to 66-10.25 (20.37m). "I felt great today, technique-wise. I had two throws that rolled that would have been bigger," said Felty who smashed the previous meet best of South Windsor's (CT) Andre Reid of 62-02.75 from the 2001 campaign. Thornton Academy (ME) Jason Montano also wiped out Reid's mark following his second-place effort of 63-02.50. The amiable Felty put the throwing community on notice with a season-opening mark of 67.00. "It's been tough mentally, said Felty of the grind as the season progressed into its championship phase. "I've been sick over the last two weeks and that's messed with my head, but somehow I pulled it together. I was able to stay confident, I knew that I could do it. 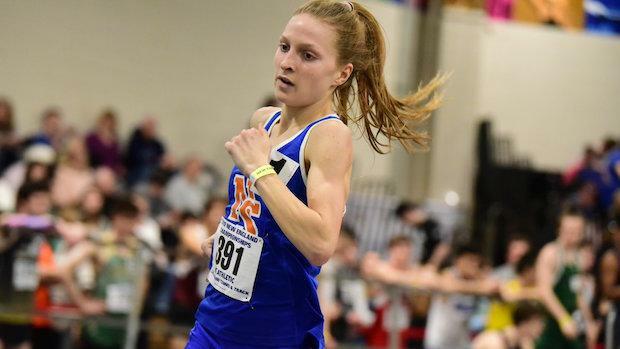 Newton South junior Lucy Jenks bolted to the front of the field during the early going in the girl's mile, ultimately taking the title in a meet record time of 4:49.57. "I was ready for a race where I would have to initiate the pace and keep pushing the entire way," she said of her pre-race mindset. 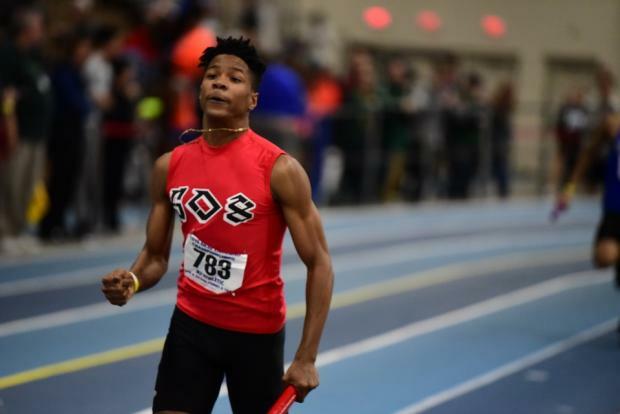 Rebounding from a second-place finish a week ago at All-States, Shephard Hill sprinter Bryan Santos regained his form, taking a tight victory in the boy's 55m over Woburn's Marcus Qualls, who topped Santos a week prior. "I feel great and feel accomplishment. I 'm amazed and speechless right now, I would have liked to run faster but will take the time I got today," said Santos who's expected to take on the 55m and 200m at Nationals. Acton-Boxboro senior Adam Yang took the 55m hurdles in 7.39 edging Sacred Heart's (CT) Edward Williams (7.47) in a resounding bounce back performance rom his first loss of the season with a US #9 season best performance in the event. Medfield's Ryan Eng closed for third in 7.59. 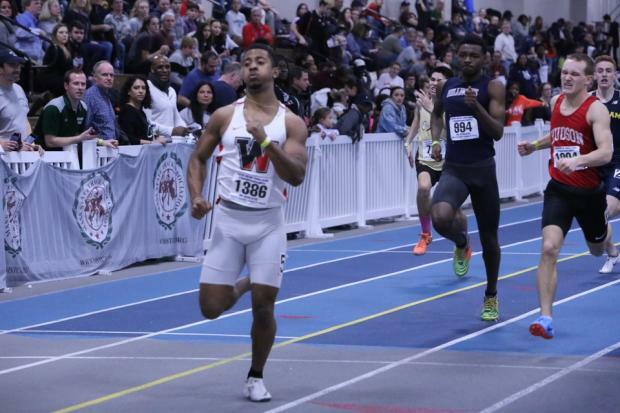 Watertown's Mange Camara stayed perfect this season in the 300 meter dash as he won the boys 300 title at New Englands with a 34.47 clocking racing against Rhode Island state champ Steven Doss (2nd, 34.87) of La Salle Academy. and MIAA All-State Meet runner-up Michael Blake (3rd. 34.87) of Hudson. 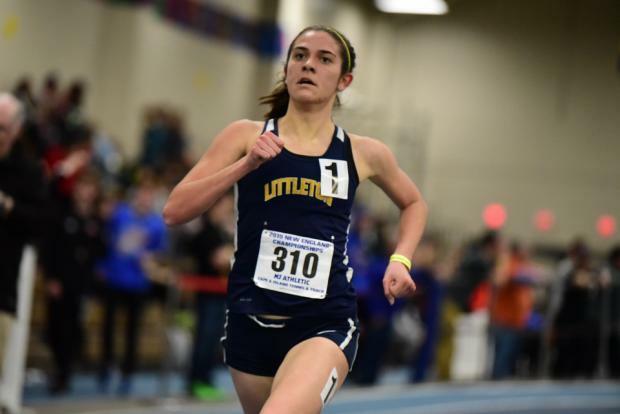 Littleton senior Sarah Roffman had a nice succession of titles to cap off her final high school indoor track season winning the girls 2 mile at her division championships, the MIAA All-State Meet, and capping off with her first New England Championships title. Roffman broke away with the field by a 12 second margin of victory to run a swift time of 10:43 in a warmer than usual Reggie Lewis Center. Wellesley junior Derek Chalmers paced a Massachusetts sweep of the long jump, soaring 6.92m (22-08.50). Lowell's Richmond Kwaateng copped a second (6.88m/22.07.25) with John Curtin of St. John's Prep rounding out the top three in 6.88m. Cameron Garabian of Seekonk took the shot title on the girl's side with a distance of 45-09.25 (13.95m). "My training has gone well over the last few weeks and I think that prepared me for this meet," said the senior." Closing out a banner day for the home state crew was the top seeded Brockton boys winning the 4x400 meter relay as they led from the gun virtually in the seeded section en route to a 3:22.01 victory as it was a 1-2 finish for Massachusetts with Methuen grabbing runner-up in the relay race at 3:23.51.